MICHELLE: Hey, Melinda? What did the fish say when he ran into the wall? MELINDA: I don’t know, Michelle, what did the fish say when he ran into the wall? MELINDA: Okay, that time I actually laughed. MICHELLE: Yay! Victory at last! Anyhoo, I believe it’s your turn to go first in talking about some of the manga you’ve read since we last convened. 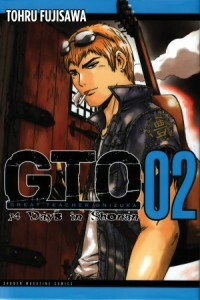 So, first I caught up with you (and the rest of the manga blogosphere), and finally read the first two volumes of GTO: 14 Days in Shonan, the latest hit from Vertical. I have to admit, that despite all the praise, I was a little reluctant to dive into the GTO universe. I’d never read any of it when it was published by Tokyopop, so I wasn’t at all familiar with the characters, and even after your reassurances a few columns ago, I still couldn’t quite shift myself from simply “intrigued” to “actually cracking the books.” This week, I finally did it, and I am pleased to say that I enjoyed myself so much that I decided to bring it here to the column, even though we discussed the series so recently. You’ve already covered the premise, so I won’t rehash it all here. While, unlike you, I didn’t worry about the comedic sensibility coming too close to something like Detroit Metal City (I loved Detroit Metal City), I did worry that I’d just find it all kind of… boring. Or maybe contrived. Fortunately, it was neither, and (again, unlike you) I think I just might be looking to try to track down all the series’ previous volumes. What I found pretty spectacular about 14 Days in Shonan, is that it features a main character who spends a lot of time telling other people just how much of a badass he is, while actually being a badass. Usually, if a character has to tell me how great he is, that’s a sure sign that I won’t think he’s great at all—but in this case, Eikichi is exactly what he says he is, and I find myself with absolutely no doubt at all that he’ll be able to do absolutely anything he says he can, including winning over all the teens at the White Swan Children’s Home, while also possibly saving the world. And perhaps curing cancer. Can you tell I liked him? Seriously, though, I enjoyed these volumes so much more than I expected, I find myself wishing I had some kind of award to give out for it, or something. It’s been a while since my expectations were so neatly trounced. MICHELLE: Yay, I’m glad you liked it! I like what you said about the reader’s confidence in the protagonist’s ability to make good on his promises; I absolutely felt the same. I should also note that I liked the second volume even more than the first, and am at least intrigued by the prospect of reading the earlier series, if daunted by the expense of such an endeavor. MELINDA: I’d say that I preferred the second volume as well, and I’m actually glad I saved them up to read together. Though now, of course, I’m anxious to get to the third! So what have you been reading this week? MICHELLE: Well, speaking of second volumes… I checked out volume two of Durarara!! this week. For the uninitiated, this is ostensibly the story of a kid named Mikado, who has moved to Ikebukuro to attend high school and has encountered its various peculiar residents. There’s a lot more going on besides that, though, including a mysterious gang, a nefarious pharmaceutical company, and a headless (female) figure in black who rides through town on a motorcycle. I deemed volume one “weird but intriguing,” and was hoping things would start to make a bit more sense in the second volume. And they do. I think, though, that my favorite plotline—the mystery surrounding Celty, the black rider—may actually now make a bit too much sense. A key revelation regarding her felt so obvious I’m left wanting a twist of some kind. “Is that all there is?” Meanwhile, other aspects of the story are still fairly baffling at this point. I guess my gripe is I’d prefer a more balanced march towards clarity, as opposed to a lopsided one. Durarara!! is a very stylish series, and not one with a whole lot of depth, and I’d hate to see Celty’s tale resolved in a perfunctory manner. MELNDA: I admit I had little patience with volume one, and though it’s heartening to hear that volume two is more coherent, I’m not sure it’s my cup of tea. Normally, I can deal with waiting for things to make sense, but it sounds like the payoff may not be worthwhile. MICHELLE: Yeah, I really don’t know at this point. I’m willing to keep going with it a while longer, but I have no idea whether I’ll be satisfied or annoyed in the end. What else did you read this week? 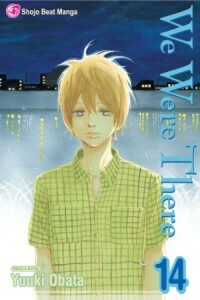 MELINDA: On a very different note, I also read the latest volume of one of my favorite current shoujo series, Yuuki Obata’s We Were There. Though this is a title I have reviewed regularly, I think this may be the first time I’ve brought it to Off the Shelf. For anyone who might be unfamiliar with this series, it’s one of those titles like Sand Chronicles that begins as a high school romance, but eventually takes its characters much further into their lives, ultimately feeling much more like josei than shoujo, at least for my money. Though unresolved teen emotions are a major element of the romance, the characters also must face much more grown-up concerns, like jobs, marriage proposals, and taking care of ailing parents. Clinging to first love is often a theme in these types of stories, and that’s certainly the case with We Were There, though it’s only “first love” for Nanami, the story’s heroine, as one of the romance’s primary conflicts is hero Motoharu’s lingering feelings for his former girlfriend who died in a car accident (and some of the ill-considered choices he makes out of guilt and grief). Though the plot is pure soap opera, Obata’s handling of it is so thoughtful and complex, it feels very little like anything I would normally describe with that term. Like Obata’s writing, the relationships in We Were There are as delicate as a scrap of old lace, ready to crumble at the slightest touch. And crumble they do. This series has long been a favorite of mine—one of a short list of shoujo manga (along with more dramatic titles like Banana Fish and Tokyo Babylon) that’s made me sob helplessly for long periods while reading. So it was a bit of a surprise to me to find that volume 13 left me feeling completely disillusioned with the story’s primary relationship, to the point where I no longer had any desire to see it rekindled. I was okay with this, really. After all, there was another perfectly wonderful love interest just waiting there for my heroine. I didn’t need to care about Nanami and Motoharu anymore. I really, really didn’t. And that, volume 14, is how you write a shoujo manga. Heh. MICHELLE: I stalled out on volume four of We Were There, but I actually just started over from the beginning the other day! If all goes according to plan—and if you don’t mind a bit of redundancy—I’ll be talking about this volume next week! I really look forward to seeing how the series progresses, as I am still firmly in the high school portion of the story. MELINDA: I will be thrilled to hear what you think of this volume next week! And I’ll take care not to spoil you any further. What else do you have for us this week? MICHELLE: You may remember that I was a big fan of Dining Bar Akira, a BL oneshot published by NETCOMICS. So when JManga licensed another oneshot by its creator—Tomoko Yamashita—I knew I had to read it. Still, she’s got nowhere else to go, so Taeko and Masuda continue to cohabitate. Yamashita has a lot of fun with the premise, positioning speech bubbles and house plants in front of Masuda’s nether regions, and eventually introducing a friend for Masuda whose cool and sophisticated veneer hides a penchant for juvenile humor. A couple of would-be serious moments don’t quite work however, and make it hard to remember that this is a comedy and certain things don’t really need to make sense. Also included is a story called “3322,” in which another young woman is staying with her father’s acquaintance. Kanoko is considering leaving school, so her father has her stay with Chiyoko, who is probably her mother. While Chiyoko has a dalliance with a local man, and her friend Yoko seems to pine unrequitedly for her, Kanoko finds herself interested in Yoko while frustrated by the adults and all their secrets. It’s an interesting tale and one I wish could be expanded upon. Although a little uneven, Don’t Cry, Girl is still a lot of fun. And JManga’s now got another Yamashita title up—Mo’some Sting—which I will definitely be checking out! MELINDA: Okay, now I’m giggling thanks to just the bit of dialogue you quoted! Silly manga is not always to my taste, but this sounds like far too much fun to pass up! MICHELLE: I think it’s just the right kind of silly. Once again, I find myself thanking JManga for offering something it’s very unlikely we would’ve been able to get in English otherwise. New est em, new Tomoko Yamashita… could new Saika Kunieda (Future Lovers) be next? One can only hope! MELINDA: That’s worth some hope, indeed! Love the part in which you guys made comments on don’t cry girl. and yes it’s def. exceedingly funny. 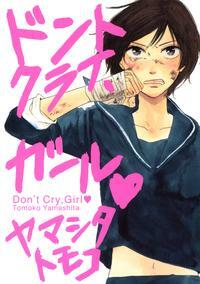 i’m happy to read such an upbeat manga by yamashita, and one that is non-BL. i’d love to be able to read her other more serious non-BL works, and i hope that opportunity comes soon. Dining Bar Akira continues to be my favorite. I can recall various parts of it so vividly! I read Black-Winged Love, too, but I don’t remember much of it at all, alas.